Automate nesting of sheet materials for various types of cutting in such a way that the remnants of the material are minimal. 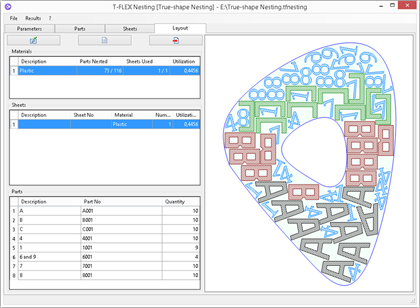 T-FLEX Nesting program is an application for the T-FLEX CAD program and is designed to automate a nesting of sheet materials for various types of cutting. The program accurately and quickly calculates the parts nesting layout in such a way that the remnants of the material are minimal. 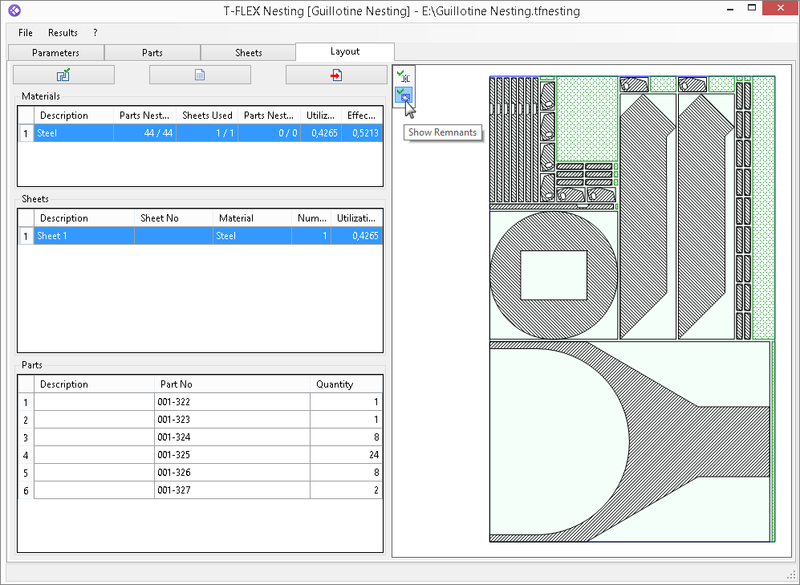 Nesting layouts can be exported as a T-FLEX CAD drawing and used to prepare programs for CNC machines. The nesting project combines the initial data, the nesting parameters and the results of the calculation of the optimal nesting. There are general settings in the project parameters that related to the solution algorithm (gaps and indents, size of usable remnants, placing parts inside other parts, solver optimization level, etc.). 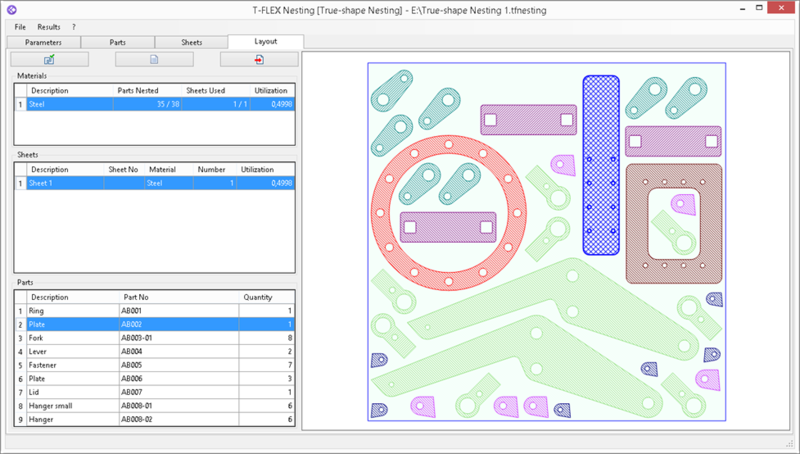 As the initial data of parts and sheets, it is possible to use hatch contours, added from one or several T-FLEX CAD drawings. Optimal nesting of materials is the most important task of the procurement production. Nesting can be used for various types of sheet materials, such as glass, metal, wood, plastics, etc. The main users of the nesting program are specialists engaged in the normalization of cutting operations, obtaining optimal cutting patterns and processing technological documentation. Guillotine nesting allows to obtain optimal nesting layouts of sheet material using through cuts. Sheets with defects may be set for the guillotine nesting in the program. The program performs calculation taking into account the existing defects. It is possible to set a certain number of parts "to stock" for guillotine nesting to provide a stock of the most demanded parts. The possibility of manual reallocation of parts on the nesting scheme will allow the specialist to determine the position of the part based on the characteristics of the material to be nested. True-shape nesting allows to obtain optimal nesting layouts of sheet material. The required parts can be of any arbitrary shape. Linear nesting is a nesting of sheets in whips. Layouts of optimal nesting with the ability to display cuts and material remnants, the value of the material utilization ratio for each sheet. 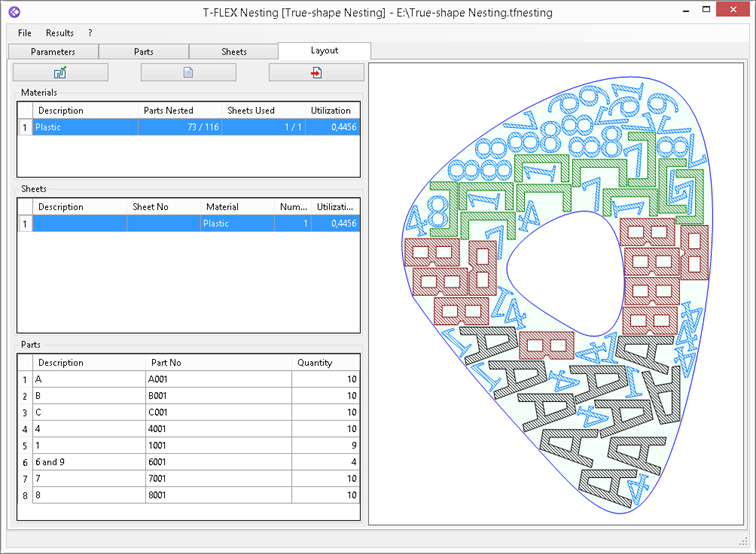 The resulting nesting layouts can be exported to T-FLEX CAD for further analysis and creation of documentation. Summary information about nesting: the number of specified and nested parts and used sheets, the values of material utilization ratio and effective material utilization ratio taking into account the usable remnants. 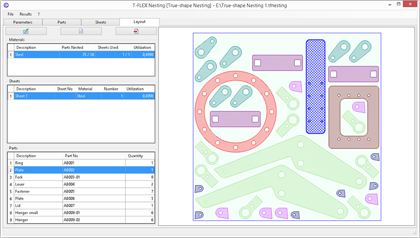 Between the contours of parts and sheets in the nesting project and their initial geometry in T-FLEX CAD drawing supports associative relation. Due to this, when changing the hatching contours in the drawing, the corresponding contours of parts and sheets in the nesting project can be updated. The update performed manually, which makes it possible to take into account the changes in the original geometry when necessary. To simplify the spline geometry of parts contours, several options for geometry simplifying are possible that affect the calculation speed. The simplest case of simplification with a rectangle is used for parts that have notches, chamfers or fillets, which should not affect the nesting scheme. The wide possibilities of T-FLEX CAD import / export remove restrictions on the exchange of any data for nesting with third-party programs.